Aloof and self-conscious, Greg Gaines (Mann) is a senior at Pittsburgh’s Schenley High School. He keeps himself to himself and avoids the standard drawbacks of high school life by belonging to all the various cliques rather than just the one; for Greg this means no one gets on his case, and his life remains unblemished by involvement with anyone other than his best friend, Earl (Cyler). Together, they make home movies based on the pictures they like, but they give them all alternative titles, such as Sockwork Orange and My Dinner With Andre the Giant. Greg’s carefree, reclusive life is thrown into turmoil when his mother (Britton) announces that a fellow student of his, Rachel Kushner (Cooke) has been diagnosed with leukaemia, and his mother wants him to spend time with her, and be her friend. Greg visits Rachel and he confesses the reason why he’s there, and asks her to go along with his mother’s idea so that he won’t need to bother her after this one visit. But Greg’s quirky, unorthodox way of looking at things amuses Rachel, and they agree to keep meeting up. Earl convinces Greg to show Rachel the movies they’ve made, and she finds them entertaining. As Rachel’s condition worsens, so Greg finds himself spending more time with her, and supporting her through her illness. When he and Earl are found making another movie by Madison (Hughes), the girl Greg has a crush on, she tells them they should make a movie for Rachel. Meanwhile, Rachel convinces Greg to apply for a local college; he gets accepted but his grades begin to suffer because of all the time he spends with Rachel. But when she decides to stop having chemotherapy, her decision causes Greg to become angry with her; they argue, and unable to vent his anger on Rachel, he takes out his frustration on Earl, which leads to their friendship ending. And to make matters worse, his failing grades mean he loses his college place. 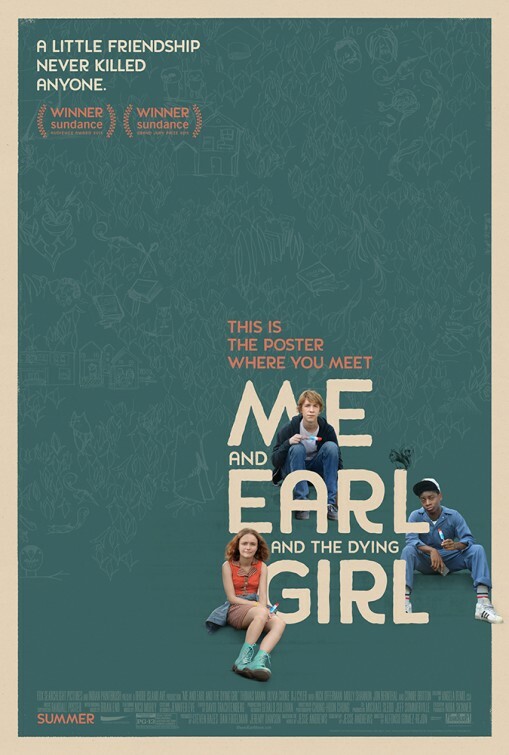 A hit at this year’s Sundance Film Festival, where it won both the Grand Jury Prize and the Audience Award, Me and Earl and the Dying Girl arrives at cinemas trailing a heap of advance praise, and with raised expectations. An adaptation from his own novel by Jesse Andrews, it’s a bittersweet coming-of-age/disease-of-the-week movie that is intelligently crafted, beautifully acted, and put together so effectively that it constantly surprises and entertains in equal measure. Where many teen-related movies trade in clichés and broad stereotypes, Me and Earl and the Dying Girl avoids such drawbacks by keeping them far enough in the background that they register, but not with any cause for concern that they’ll ever undermine the good work Andrews’ script has built up. There’s a recognisable milieu here, to be sure, but it’s one that’s skewed and twisted through the unhappy state of Greg’s perception. He doesn’t want to get involved with Rachel and her illness, but to his surprise he finds that she likes him, and this emboldens him to turn away from his usual selfish, rootless behaviour. Blossoming from the attention that Rachel gives him, Greg comes to depend on her approval, and he has the idea that this is reciprocated. But when Rachel stops taking her meds, and he falls out with Earl, he learns a valuable lesson: that friendship is more complicated than he’s ever considered. As Greg navigates his way through the choppy waters of teen angst and self-imposed reclusivity, Rachel’s bravery in facing her mortality is used in sharp contrast to highlight Greg’s lack of empathy. He finds a purpose in befriending Rachel but it’s at the expense of his carefully arranged lifestyle, and her determination has the effect of threatening to eliminate the new emotions and feelings he’s begun to experience. Torn between his need for these feelings, and the safety provided by his usual reticence, Greg has to face up to the uncomfortable fact that, in Rachel, he’s found someone he cares about as much, if not more so, than himself. This leads to him being noticed in school, something he’s studiously avoided, but by being forced out into the open he benefits in ways he would never have imagined, and especially when Madison asks him to be her prom date. That Greg slowly matures over the course of the movie is a given, but thanks to Andrews’ confident, eloquent script, his journey is less one of self-discovery than selfless acceptance that some friendships or relationships will cause pain more often than not, but it doesn’t mean they’re not worth it. Rachel learns to accept her fate, and in the end she embraces it with a fierce disregard for the fear she has about dying. She’s almost heroic in a way that teenagers can’t generally manage, and it’s a tribute to the script and Cooke’s performance that even when Rachel is sad and afraid it’s heart-wrenching to see someone finding hidden sources of courage that will also weaken her further. If Greg and Rachel’s friendship forms the core of the movie’s focus, then Greg’s friendship with Earl is its foundation, their relationship bordering on the kind of geeky mutual reliance that allows two outsiders to bond without any formal acknowledgment of their dependence on each other. Mann and Cyler have an ease about them that translates well in their scenes together, and the way they covertly emphasise the regard they have for each other is touching. Both young actors are excellent, teasing out the subtle nuances of their characters and looking entirely credible throughout. With all three leads on superb form, they’re more than ably supported by the likes of Offerman and Britton, and there’s a great, unexpected cameo from Hugh Jackman that highlights the offbeat nature of the humour – Greg’s penchant for pillows, for instance. But while there are plenty of funny moments, this is still first and foremost a drama, and Gomez-Rejon’s self-assured direction teases out themes of alienation and personal courage, self-pity and despair with precision and skill, guiding the characters through their travails with a fondness for them that is evidenced by the clarity with which their thoughts and feelings are portrayed. It’s a movie that’s also been wonderfully shot, with Chung-hoon Chung’s photography framed to perfection and lit with such confidence that every scene has the look and feel of a still shot. The movie further benefits from a cleverly muted score by Brian Eno that plays along in the background for the most part, and acts as an indirect reflection of the movie’s moods, accentuating some and downplaying others, its quirky nature almost like a character in itself. The movie is stylish, thoughtful, acutely aware of the message it wants to impart, and effortlessly affecting. Rating: 9/10 – this year’s indie movie to beat, Me and Earl and the Dying Girl is the kind of multi-layered drama that rewards the viewer in so many ways it’s like taking part in a feast; imaginative and delightful, it’s a movie that actually has something to say, and does it eloquently and with commanding ease.